ArbelSoft offers 4 different software products and POS systems which are as follows: CleanMax, ShoeMax, LaundroMax, and TailorMax. Additional supplemental programs include SyncMax, for multiple store management, BackupMax, SoundMax, and AssembleMax. ArbelSoft programs feature intersoftware compatibility which allow use with other ArbelSoft software products such as CleanMax with LaundroMax or pairing it with a supplemental program such as AssembleMax and SyncMax. Our programs are flexible enough to meet the complexities of your business, and have thus been created in 2 different versions: Standard & Full. The full version is most appropriate for business owners operating large scale enterprises that necessitate A/R functions and pickup and delivery demands of consumers in the case of dry cleaning. The standard version is a simpler and more affordable version. Both versions come equipped with an integrated credit card system for processing, which are transmitted via internet. Each of our versions consists of 3 levels which can be adjusted to match the user’s preference. Level I is fashioned for the user who prefers simplicity in navigation and functionally whereas level III offers the most advanced features and operates at the maximum of CleanMax capabilities. Level II finds the balance between the advanced features of Level III and the convenient simplicity of level I. However, regardless of the version or level number, all of the basic hardware specifications for our programs demonstrate the same reliable quality. 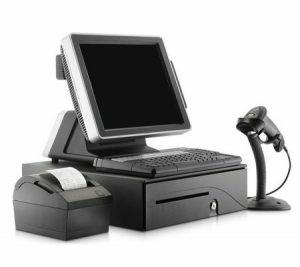 We offer 2 POS Packages, the basic system consists of a Computer, a Touch Screen Monitor, an Invoice Printer, a Cash Drawer and UPS, Battery Power Backup (Rental systems comes with a SSD hard drive in place of a battery backup), as well as an All in One system, which consists of a computer, touch screen monitor, and a thermal receipt printer that is integrated into a single piece of hardware. All hardware were chosen from amongst the most durable and reliable brands like Metrologic, Motorola, Honeywell, Datalogic, Logitech and Digitalpersona. We also use scales by Mettler Toledo, CAS, and A&D, Posiflex & MMF cash drawers, and printers by Star, and Zebra. We use Dell Computers equipped with an ELO touch screen monitor, as well as an All in One system, which is comprised of a touch screen monitor, computer, and invoice printer on a single hardware. We have also partnered with Firstdata-Ignite, the only integrated processor, to process all credit card transactions through the POS System. ArbelSoft Software has a Microsoft Windows based operating system and a Microsoft SQL supported database. In October 2015, the merchant liability shift has made the previous methods of credit card transaction obsolete. In order to prevent disruption of services to our customers, Arbelsoft has worked closely with Ignite-Firstdata as well as terminal manufacturers to keep our customers up to date with the latest security measures and merchant processing standards. As before, customers will be able to process recurring billing to their customers as well as being able to accept the new EMV standard credit and debit cards. Ignite-Firstdata has a global footprint of 6 million merchants, the largest in the payments industry. The company handles 45% of all US credit and debit transactions. In working hand in hand with Ignite-Firstdata, we have procured guaranteed rates which are lower than you’ll find elsewhere, with the rates being adjusted based on monthly volume. Customers can rest assured with the belief that their business interests are taken care, safeguarded by Arbelsoft and Ignite-Firstdata. First Data boasts over 40% market share out of the top ten prime credit card processors in the US including Bank of America, Chase Paymentech, and Global Payments. In our partnership we cut out third tier processors and middleman to best improve your experience. Their exclusive network has top notch security and reliability, extending to 34 different countries. All Arbelsoft software and POS systems offer date and time protection that restricts all standard employees from editing the date and time so as to prevent tampering with employee attendance data and transaction data. Furthermore, every program has a Cleanmax/Tailormax/Laundromax/Shoemax-only screen that only allows employees to access the Arbelsoft program. This is an effective measure for blocking outside internet access or the simultaneous usage of other programs that could lead to system corruption or virus infections. By implementing the new EMV chip enabled terminals, users can rest assured that the transactions are protected from hacking as all new chip enable cards are processed with encryption. Finger Print Reader ’ The finger print reader quickly and automatically captures and encrypts the finger print image before verification. Passwords and password management are taken out of the hands of end-users, improving security, simplifying life for end-users and administrators. Ideal for keeping track of employee attendance control or for simplifying employee passwords in a second. ArbelSoft products offer the maximum level of flexibility. Not only do the programs offer varying levels and versions to suit the needs and complexities of your business situation, but they allow for users to make the most accurate upcharges and inventory descriptions and offers a range of over 380 varying and versatile default setup options. You can personalize your ticket style, marketing flyers, newsletters, coupons and price setups are extremely adjustable and customizable. You may delegate employee specific access rights and restrict access from any function or module, especially the more sensitive functions that directly pertain to cash control. All ArbelSoft programs are compatible with foreign currencies, foreign weight entries, any kind of tax (i.e. GST, PAT, VAT), tax rates, sales taxes, as well as tax exemptions. The programs enable users to sell sales items along with processing customer drop off orders, and even comes equipped with an inventory and supply chain management tool that can help users process orders between the warehouse and vendor and manage its distribution channels. Explore the versatility and flexibility of our products by scheduling a live demo today! Due to many inquiries from current ArbelSoft customers for a solution that integrates their website to ArbelSoft products to enable customers to connect and review statements, update information, request or cancel route service orders, and make payments, we have introduced WebMax. If you do not already have an existing website, WebMax features professionally designed sample web templates that can be customized for your suitability. All templates are linked directly to ArbelSoft products via user-login. We also offer another solution called GateMax, which is an interface software that enables access to our database after making minor modifications to your existing website. ArbelSoft products currently offer the fastest ticketing process of all POS computer systems on the market. Ticket generation also has a high level of personalization and customization, which includes functions to include your company logo and design. The system accepts any tag system either with or without a tag printer. Permanent heat seal and disposable 2D barcode tags can be printed out via the Zebra TLP 2824 or the Zebra GX430T, and 3 styles of piece or lot system tags can be printed out by the Star SP742 printer. ArbelSoft products have also interfaced with Metal Progetti and recognize inputs from HMC, IOWA and White Conveyor garment assembly systems. All barcode tags are synced with our own in-house garment assembly system interface called AssembleMax. We successfully launched our initial public demo of the AssembleMax program at the Clean Show 2011 in Las Vegas. All ArbelSoft software are compatible with Windows 7, and use Microsoft SQL. – BackupMax is a hosting service, which stores all of your computer data in a data bank so that all of your important information can be quickly and easily restored in case of any damage that may occur. High Speed DSL required. See Services page for more information. – A complementary audible greeting software, which greets the customer and reports the amount due. Greetings can be changed seasonally or personalized as much as you would like. – CleanMax is interfaced with a controller that finds the customer’s garment automatically because ticket numbers are assigned into the CleanMax system for customer pick up. The controller can memorize up to 40 ticket numbers so that the conveyor can stop sequentially by the exact ticket information entries. Support up to 9 conveyors of any brand or length. Quick and easy installation. – We offer scales by A&D, Mettler Toledo, CAS, and Atron. Available options are as follows: 15″ by 21″ platform scales for Laundromats, desktop scales for dry cleaning wash & fold drop off orders, and floor models for commercial bulk rate laundry. – We offer both dual and quadro cash control with Posiflex and MMF cash drawers, respectively. Our program enables managers to set employee specific access rights to cash drawers for security purposes. – Higher image clarity in any light. Quality glass optics and superior VGA performance. The PC camera can capture up to 8 time stamped images for drop & pick up as a means of proof for the initial condition of the garment. – Logic Controls pole displays are widely known as the market leaders for PC-based POS systems. They have long set the standard for reliability, value and functionality – reasons why most value-added resellers ask for Logic Controls displays by name. – Upon 2 rings, the Caller ID will appear as a pop up on the screen indicating the customer name and several different categories such as pick up, delivery, other, etc so that you can quickly categorize and save the reason for the customer’s call with a one touch button as a message. The message button will also turn yellow as a reminder of tasks or requests to be fulfilled. You must contact your local telephone provider to add in a Caller ID service in order for our Caller ID feature to be compatible. For new users or those under service contracts with specific questions or issues regarding the product, please sign up for an appointment based live training session for extra help and assistance. We provide 4 hours of free training with the renting or purchasing of our system. The customer may have an additional 4 hours training session if requested within 30 days of purchase. Our warranty and service entitles buyers to 24/7 technical support and a 1 year Warranty term. The Warranty covers software and hardware replacements, including parts and labor. Our Customer care plan is comprised of 4 tiers, which include Silver, Gold, Platinum and Diamond levels. These plans range in services from basic software updates to full support which covers hardware replacement (including labor and parts) and BackupMax, a remote hosting backup service. Services may be dependent on customer demand and system configurations. We offer several purchasing options which allow our customers the flexibility to devise a payment plan that puts the least strain on their finances. The purchasing options are as follows: Buy, Rent and Reserve or an Interest Free Payment plan. All purchase Options [Buy, Rent, Reserve, Interest Free Payment Plan] are available for the purchase of both software & POS systems. We are going to be launching all ArbelSoft products in 6 different languages to accommodate our international users. These include the following: Spanish, Portuguese, French, Italian, Russian, & Turkish. We will also be accommodating address and telephone number entry for 14 countries with our international versions. If you are interested in Arbelsoft products, Call us +1 877 939 1212 Now! © 2017 Arbelsoft Inc. All Rights Reserved.